I really enjoy a good sandwich, especially from a fast food place. 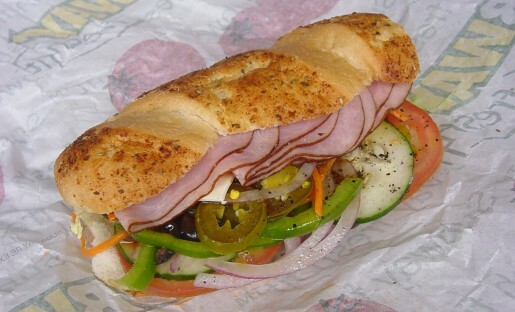 Since they’ve added the toaster oven and the $5 footlong deal, I’ve eaten a ton of Subway. I go probably every two weeks, where before I’d only go every few months. Needless to say, I love the fact that they’ve got a ton of ingredients on their toppings bar; however, one Florida couple got an unexpected addition when they found a knife baked into the bread. While it’s not a normal topping, it is a pretty good way to make sure you get your daily requirement of iron. People find unpleasant additions in food all the time, myself included. This is why I always inspect my sandwiches before I eat them. This way I don’t get anything I don’t want, like olives or plastic forks or, worst of all, cheese. I hate cheese. I’d rather find a knife in my bread than find a slice of cheddar.